China Southern Power Grid (CSG) has signed a Memorandum of Understanding (MOU) over feasibility study on cooperatively developing and building Laos' national power grid in the Lao capital Vientiane. With the witness of Lao Deputy Prime Minister Sonexay Siphandone, visiting CSG Board Chairman Li Qingkui signed the document on Wednesday evening with Lao Minister for Planning and Investment Souphanh Keomisay and Managing Director of Electricite du Laos (EDL) Boun Oum Syvanpheng. 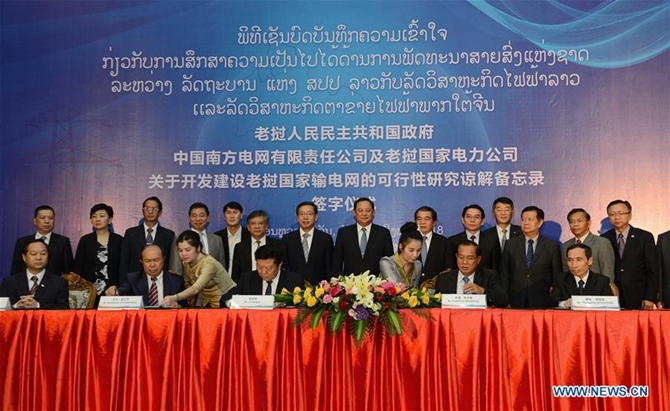 According to the MOU, CSG will cooperate with the Lao side, with combined advantages and mutual benefits, to build a national integrated backbone power grid as to improve power transmission capacity and electricity supply reliability in Laos, and support the country's sustainable socio-economic development. At the same time, the CSG also donated 1.2 billion kip (some 142,000 U.S. dollars) to the Lao government at the singing ceremony, to help the flood-hit victims in southern Laos to rebuild their homes. On July 23, a saddle dam of the Xe-Pian Xe-Namnoy hydroelectric power project, invested by South Korean, Thai and Lao companies, burst, unleashing flood water from the mountain to 13 villages of Sanamxay district downstream the Xe Pian River, some 560 km southeast of Vientiane. Six villages were almost submerged by the muddy flood with 13,000 villagers being affected. An CSG official told Xinhua that as the first Chinese power grid company going global, CSG actively implements the Belt and Road Initiative by enhancing power cooperation with Greater Mekong Subregion (GMS) countries.